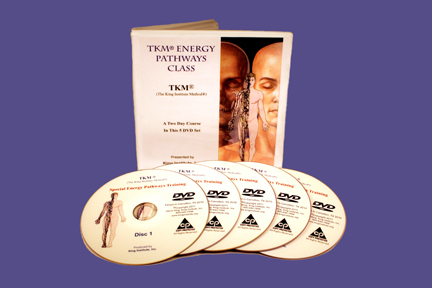 This two-day course in a 5-DVD set is a very informative class for graduates of TKM Introductory Levels 1 and 2, based on volumes one and two of the TKM textbooks which include the 12 organ energy pathways. This training will go beyond that introductory training to include the Median, Supervisor and Mediator pathways in this in-depth study of the origin and direct connections of the pathways leading from one system to another, plus how and where this takes place. This understanding provides correlations which releases greater understanding to utilize TKM with far greater troubleshooting abilities and better understanding of symptoms and sensations experienced during or after TKM sessions. Glenn Thomas King, PhD, CDN, CN, Rev, director and founder of King Institute, Inc., teaches this course and has made it possible to learn and review this information at your convenience through this DVD set. This course covers varied topics related and is in a class setting which includes questions and answers on the subject matter and a deeper understanding that most students are seeking. Enjoy reviewing this DVD set over and over to help with simple or chronic to critical issues. Published by the King Institute, Inc. © 2010 Glenn T. King, PhD, CDN, CN, Rev. All Rights Reserved.